Believe it or not, festival season is nearly upon us again. And from the looks of it, summer 2015 is going to be an incredible time for music. Coachella, the year&apos;s earliest annual music festival (and the one people most love to hate on), just released its lineup for 2015. And whatever your feelings on the nature of the event ("Brochella"), it is looking extraordinarily good. Many of the biggest names in music from the past three years will perform over two weekends, April 10-12 and April 17-19, in Indio, California. First up to headline are rock legends AC/DC, whose recent album, Rock or Bust, was actually well-received despite all the tragic circumstances surrounding it. Jack White will headline the second night, extending his victory lap from 2014, in which he broke the record for highest-selling vinyl since the dawn of the Nielsen era with Lazaretto. Drake, who didn&apos;t do much this year except serve as a prop in several Nicki Minaj videos, will headline the last night. By April, though, his new album should be out — and it&apos;s likely to be a hit. The supporting acts are incredible, too. Raekwon and Ghostface, Run the Jewels and Azealia Banks will perform to sate the hip-hop heads. War on Drugs, Alabama Shakes and Steely Dan will round it out for fans looking for some straight rock &apos;n&apos; roll. And Nero, Ratatat and DJ Snake will turn it up for the festival&apos;s EDM fiends. 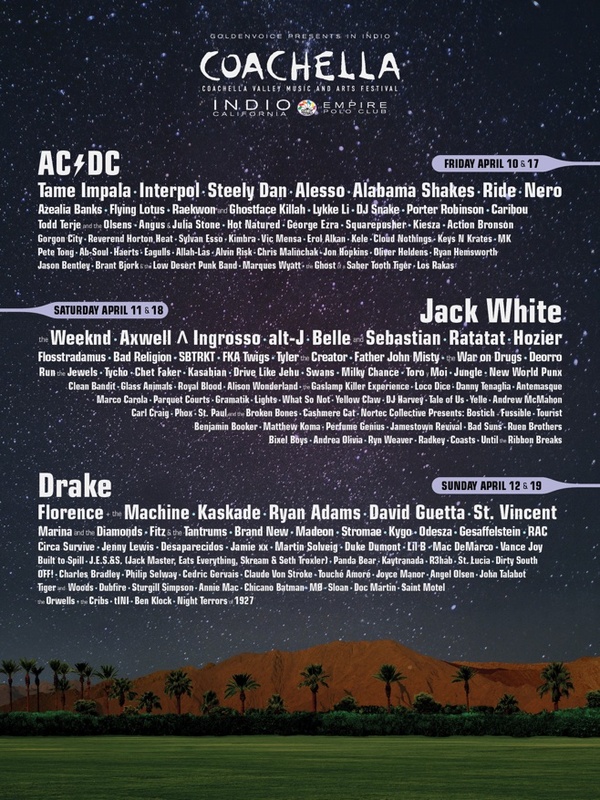 So, yes, it&apos;s worth returning to Coachella this year. Coachella&apos;s culture has one of the worst reputations in the music festival circuit. Headdresses, fanny packs, neon outfits, molly and binge-drinking are all prominently featured much to the music press&apos; delight. But the lineup is undeniably great and it speaks well for the rest of the summer&apos;s festivals, which tend to all present slight variations on Coachella&apos;s schedule. This summer is going to be epic.